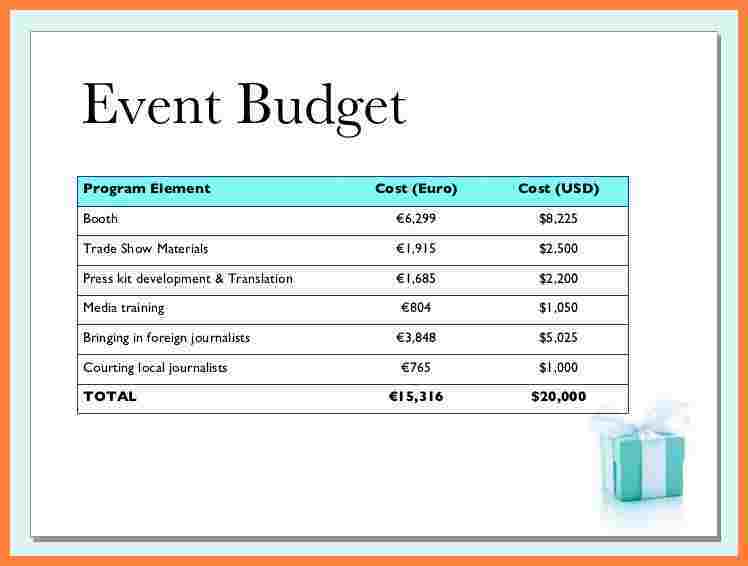 Having the right budget for an event does not need to cause major problems for the people organizing it. There are certainly times where unnecessary conflicts occur due to people having different opinions and plans in budgeting for an event. Too much turmoil will only result in the event to be a failure. 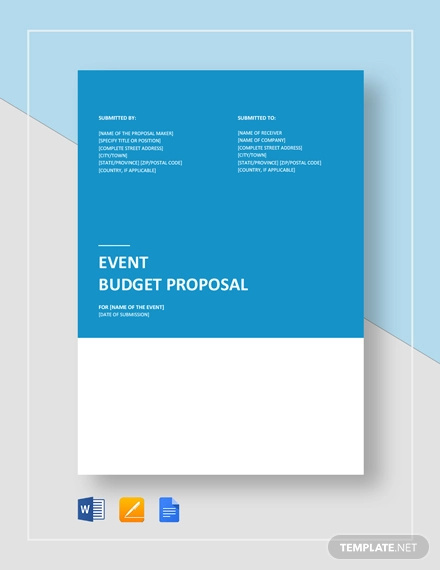 If you are organizing an event any time soon or included in the team who plans for the event’s budget, here are budget proposal examples (in PDF) that can help you in creating your own event budget proposal. 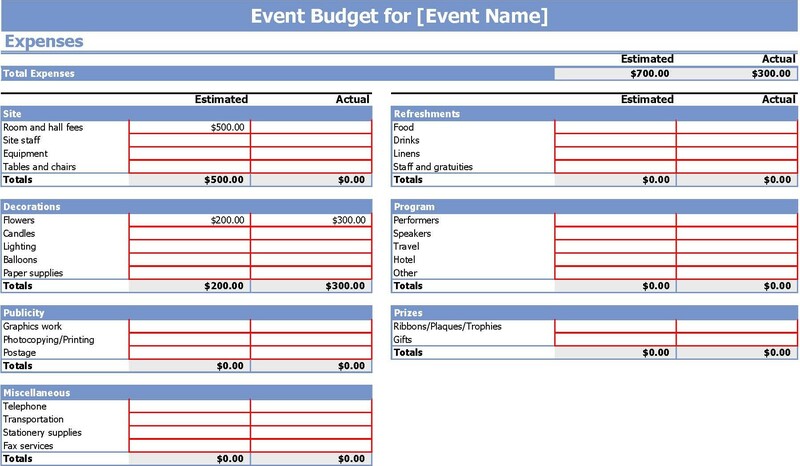 To help you create your own event budget proposal, here are the essential tips to make sure budgeting for your event will go as smooth as you initially wanted it to be. Let’s be honest, it’s very difficult to create a budget plan alone for an event that will be attended by a hundred people. 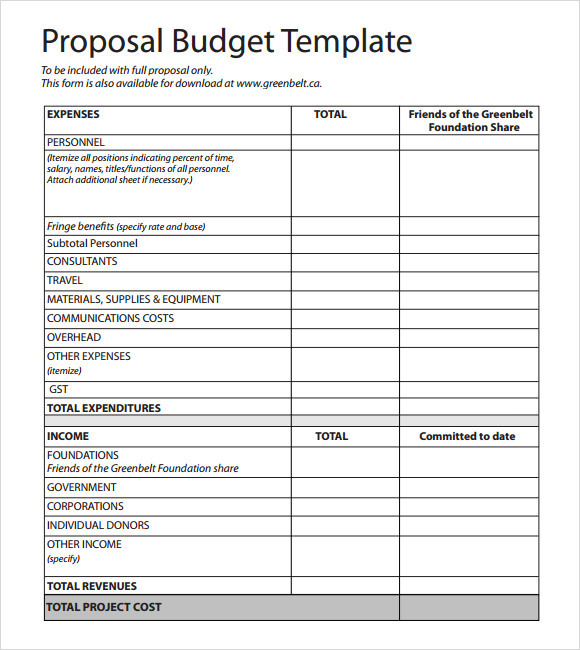 Even if you’re creating a budget proposal for a small event, you still need to consult the proposal to a number of people before cash will be disbursed and used to purchase materials. Getting a team does not entail hiring people just to create a budget proposal. If the company already created beforehand a list of individuals who will be working on the proposal, then there is no need to find a team. But if not, it is highly suggested that you handpick members of the team from within the organization, specifically those who have prior experience in event budgeting or budgeting in general. 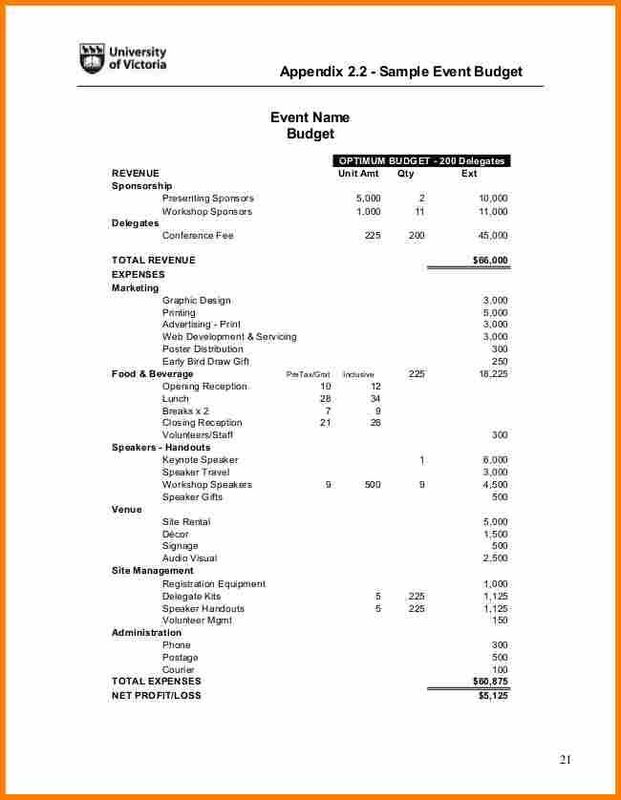 Even before planning to create an event budget proposal, you and your team should check company resources to see if the company really has enough budget to organize or hold an event. Resources do not only pertain to financial resources (i.e. cash) but assets such as raw materials, equipment, and people as well. Make sure to check and analyze if the resources can handle the duration of the event, especially if the event lasts for a few days or weeks. This ensures that resources are not only enough but also does not exhaust the company’s current (and oftentimes limited) resources. 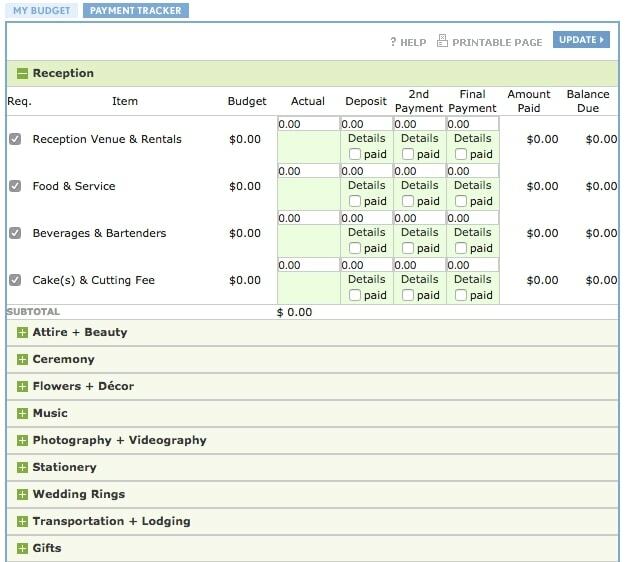 Although having limited resources does not always mean you can no longer create an event budget proposal, let alone organize an event. You can always outsource funds from a third party, most likely a business partner or an investor. Once the resources are in place, it is now time to list down the exact number of people who will be joining or participating in the event. Identifying the exact number is crucial as your resources will depend on the number of participants. You might not have enough funds if the number goes over the intended number of participants. Meet with your team on who will be exactly joining the event. 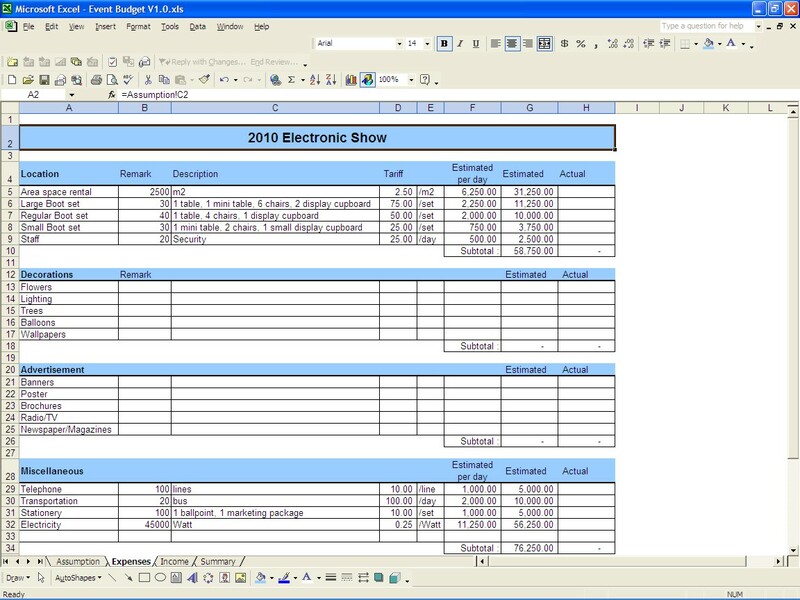 Create a list and discuss if the individuals to be invited can benefit from the benefit. Additionally, you also need to discuss if the individuals or groups are worth inviting as they might cause unnecessary raucous and issues in the event. Although having a head count for the event is important, priority should be also be placed more on the venue and the special guests who will be invited (i.e. speakers, resource persons, industry experts, etc.). An event will be nothing if there is no venue or a location where the event will be held, and the event will also be nothing if special guests who were initially invited will now show up. Listed below are the most common types of corporate events in which you may or you may not organize in your own company. Seminars and conferences are probably the most common types of corporate events. These types of events are held regularly and are held by most companies. Although the purpose of seminars are different for each company or business organization, their main purpose is basically to provide additional information or training to participants or attendees. Trade shows are corporate events or exhibitions at which a certain industry promotes their products and services. The usual industries that host a trade show are technology (smartphone, laptops, and other gadgets), food, and auto industries. Trade shows are usually open to the general public or a large crowd where a registration fee first needs to be paid before the public can participate or view the trade show. Sports events are usually participated by a single company or a number of companies. The goal of sports events is to build and strengthen relationships between people in the organization or in other organizations (usually a subsidiary or sister company). The sports event may be a single sport or a combination of sports activities. Depending on the physical condition of the employees, the company may opt for less physical sports activities. Product launch events are similar to trade shows but compared to trade shows, product launch events are more company-focused rather than industry-focused. A product launch event focuses on a single company which advertises or promotes its products. Not all corporate events are held outside the company premises. This is true for board meetings and shareholder meetings which are mostly held inside the company building or office. Board meetings and shareholder meetings are very important corporate events because these meetings discuss the overall performance of the company, as well as future goals and strategies. 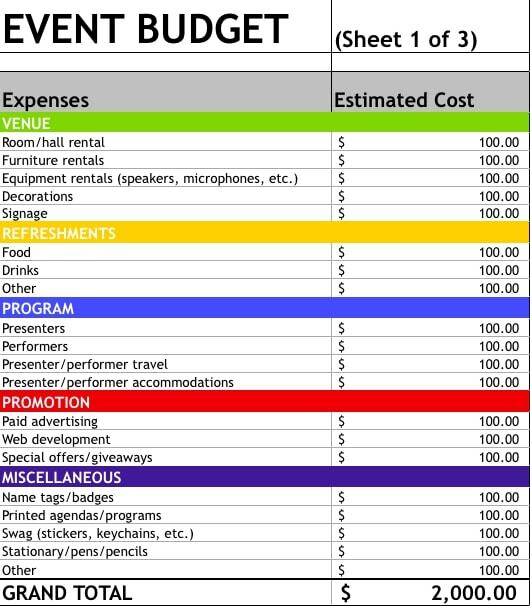 We hope you found this article to be informative as well as helpful when you will be creating your own event budget proposal. We also provided some examples that you can use as reference. As previously mentioned, having the right budget for an event does not need cause major problems for the people organizing it. There are certainly times where unnecessary conflicts occur due to people having different opinions and plans in budgeting for an event.